Love this hat! 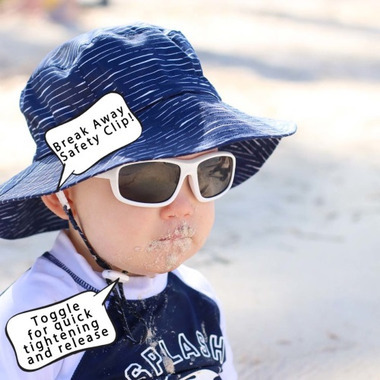 Stays on really well with the adjustable straps and has a nice wide brim for sun protection. 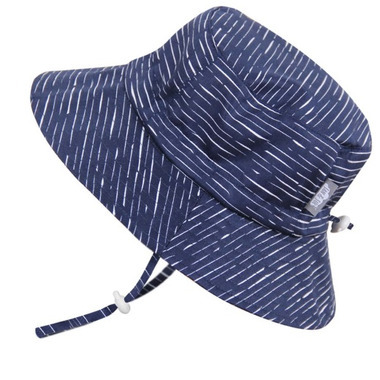 Other bucket hats we have purchased at the usual stores don't even compare. Looks really cute! Really cute hat. Nice style and pattern. I like that it's adjustable and can be cinched up to fit various head sizes. Also the safety release chin strap. This hat stays on my 4 month olds small head and he'll have lots of room to grow into it. I bought this hat in the smaller size when my little one was a few months old. Great coverage and he seemed comfortable in it. I bought the exact same hat in a bigger size this summer and we're both still loving it! I like that it covers his neck and still looks good.